As a freshman, you spend a lot of time at the barns, whether you want to or not. You constantly smell like horse poop. There is always hay in your clothes. Riding will create some of the most difficult situations you will ever be in. There is only one way through it: survive. Here are some tips to make it through your riding career. Get the good rakes. Fight for them. As well as the best wheelbarrow. A wheelbarrow with no holes is worth a lot, and saves time. Feed first. Feed before mucking, it keeps the horse happy and not in your business as you clean up their business. Make alliances. Those friends that make sure that your drinker isn’t overflowing, or your horse has been fed are invaluable. They are what decide your work crew count. Shower often. Both you and your horse. It keeps dirt from building up on your horse and makes them easier to groom, and it keeps the horse stench at bay on you (although it never really goes away). Get short sleeve button ups. It gets hot and you will be miserable. Thrift stores downtown carry them in many colors, styles, and sizes. Clean your saddle regularly. Or you will be stuck at barn cleanup for hours on end continuously saddle buttering. Have back-up feeders. Try to arrange at least two feeders when you can’t be there to feed. Have an official feeder and a back-up feeder. The back-up feeder just to go check and make sure your horse is fed, usually someone near your stall works well. This diminishes the chance of a work crew by a lot. Listen to the instructors. They know what they are doing. Being respectful and listening will get you a long way in the horse department. Be enthusiastic. Even though some days you will have no desire to ride, fake it ‘til you make it. A semi-positive attitude (at the least) will make riding much better for you. Love your horse. Sometimes they can be the most annoying, pig-headed animals on the planet. They make you want to never ride again, especially when they poop in your drinker. But love them and take care of them. It will make both of your lives easier. Riding is an opportunity to take challenges on, and not only survive but thrive. You will come to love your horse and find that when you look back on riding, however difficult it may be in the moment, it was a truly great experience. 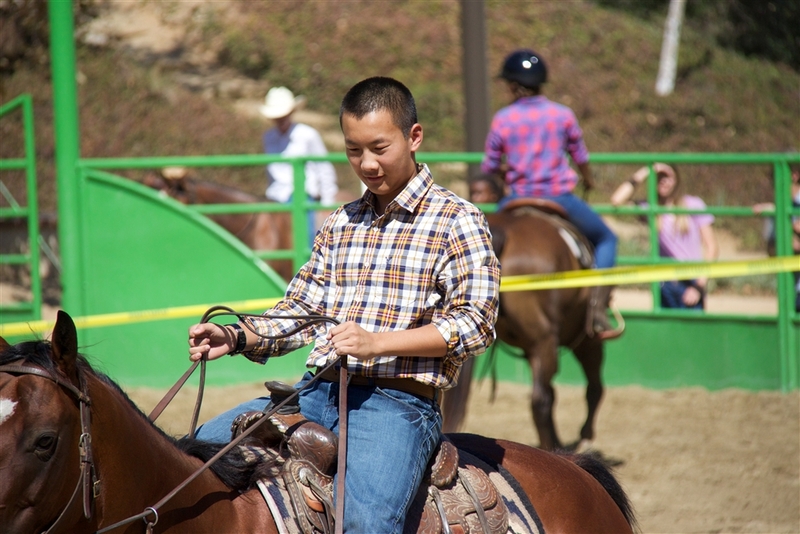 You may even decide to stay in the saddle for the rest of your Thacher career and beyond!